Auto makers, including General Motors India and Tata Motors, announced price cuts of their products soon after Finance Minister P. Chidambaram decided to reduce excise on automobiles in the interim budget 2014-15. Auto makers, including General Motors India and Tata Motors, on Monday announced price cuts of their products soon after Finance Minister P. Chidambaram decided to reduce excise on automobiles in the interim budget 2014-15. "We will pass on the excise duty relief to the consumers and are currently studying the fine print to determine the exact amount across the car lines," General Motors India vice-president P. Balendran said. However, he said though the excise duty cut is encouraging news, it would require endorsement from the new government. "The demand sentiment will only pick up after the new government upholds these announcements. In the meantime, the proposals to cut excise duty on SUVs and small cars and large diesel cars are a welcome step," he added. A Tata Motors spokeswoman said: "We will definitely pass on the benefits of these excise reductions to the consumers for our new dis-patches from tomorrow (as applicable) and are working on the details of the exact reductions." The various cuts across the different categories of passenger and commercial vehicles are a very positive step as these will make the vehicles more affordable, she added. Excise duty on small cars, scooters, motorcycles and commercial vehicles will come down to 8 per cent from 12 per cent. 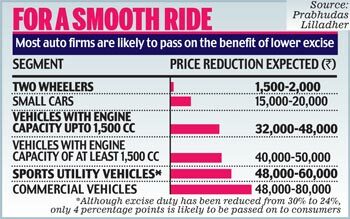 SUVs will attract excise duty of 24 per cent as against 30per cent earlier. The duty on large cars will now be 24 per cent as against 27 per cent earlier, while the duty on mid-sized cars will go down to 20 per cent from 24 per cent. The excise duty cut will be applicable up to June 20, 2014. Terming the announcement "a much-needed initiative", market leader Maruti Suzuki India MD and CEO K. Ayukawa said, "We hope it will revive sentiment and encourage people to buy automobiles." Pawan Goenka, execu tive director of Mahindra and Mahindra (M&M), said he was surprised by the reduction of duty on SUVs from 30 per cent to 26 per cent. He termed it a bold move by the finance minister but said it would be margin neutral. 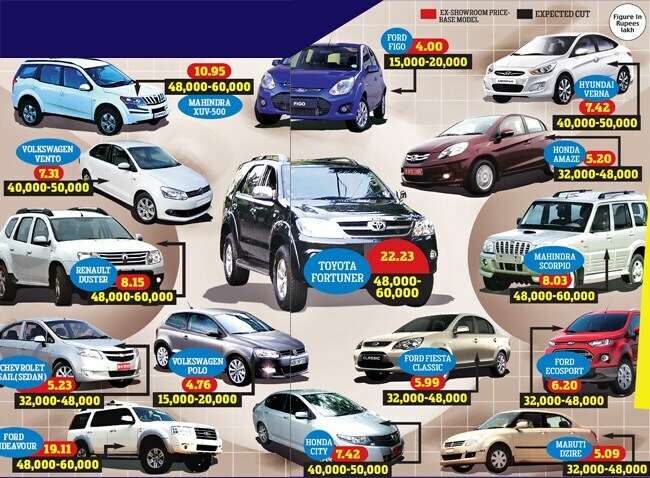 "This step by the FM and the recent auto expo is sure to bring back interest in cars. It would help the industry go back to winning ways," he said. Vikram Kirloskar, president of Society of Indian Automobile Manufacturers (SIAM), said, "This could hopefully herald a revival of the manufacturing sec-tor in the days to come." Sound-ing hopeful, Honda cars India sen-ior vice-president (marketing and sales) Jnaneswar Sen said, "These reductions will propel demand in the coming months and anchor support for a better first quarter." Hyundai Motor India Ltd (HMIL) managing director and CEO B.S. Seo said the excise duty cut has come as a breather. "This duty cut will make cars more affordable since the benefit will be passed on to the con-sumers immediately," he added. Annual car sales in India declined for the first time in 11 years in 2013, posting a 9.59 per cent dip, as the auto industry reeled under a pro-longed demand slump due to the economic slowdown.